JM Peters Park Solano Built in 1991: This Beautiful home faces East in a Private Gated Community near Cypress College. This Open and Bright Floor Plan is designed with Soaring Two Story Ceilings and stacked Windows as you enter the home. 4 Large Bedrooms and 4 Baths include a Large Main Level Bedroom with Full Bath. Spacious Formal Living and Dining Rooms with Vaulted Ceilings and French Doors. Open and Bright Kitchen with Stainless Steel Appliances, New Quartz Counter Tops with Breakfast Bar, and Daily Dining Area. The Large Family Room is highlighted with a Wood Burning Fireplace. The Interior Laundry Room offers fully Plumbed Sink, and Cabinets. 3 Car Garage with Direct Access. Fabulous Master Suite: Elegant High Volume Ceilings and View Balcony. Large Walk-in Closet. Upgraded Master Bath offers Granite Countertops with Dual Wash Basins, Vanity Area, and Updated Luxurious Soaking Tub and Separate Shower. Large Secondary Bedrooms Suites, each with their own Private Bath and Walk-in Closet. Additional Features: Updated Baths. New Designer Carpet throughout. New Interior White Paint ready for your accent colors. Recessed Lighting. 3 sets of Brand New French Doors. New Dual Pane Vinyl Frame Windows. Large Backyard with Covered Patio - Great for Entertaining with plenty of room to add a pool and spa. Very Low $54 Monthly HOA Fee. 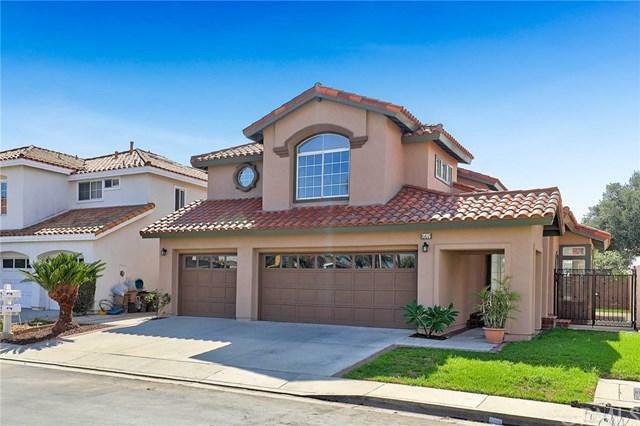 Excellent Location close to Cypress College, Shopping and Dining. And in the Highly Rated Oxford Academy School District!